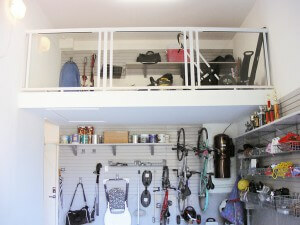 Expanded storage footprint by constructing an overhead rear wall mezzanine with an aluminum and glass railing for safety. Installed polyaspartic floor to improve visual appeal, reduce dust and facilitate easy cleaning and maintenance. Designed and constructed a slatwall door for electrical box to blend with wall system and provide easy access. Now the garage is in keeping with the rest of our home. Everything has a place including my vehicle! The mezzanine looks like it was meant to be there, and while practical and safe, looks pretty cool. The hint of glitter in the floor gives it that little extra pizzazz. 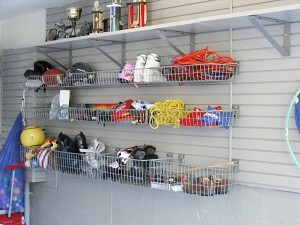 And with the slatwall band designed by NuvoGarage, we have lots of flexibility as our needs change. Moving tends to inspire the best intentions in people. It’s an ideal time to de-clutter, divest and get organized. But sometimes even the most diligent homeowners find moving house more overwhelming than planned and consequently packing and unpacking drags on longer than expected. This was the situation for a busy professional couple with two young children who moved to central Toronto. Despite their best efforts, when they settled into their new home, the garage became the repository for storage overload. The husband, a sports enthusiast, needed space to store his equipment. The wife, who has an incredibly organized Type-A personality, was frustrated with the disorganization and unrealized potential of the garage. 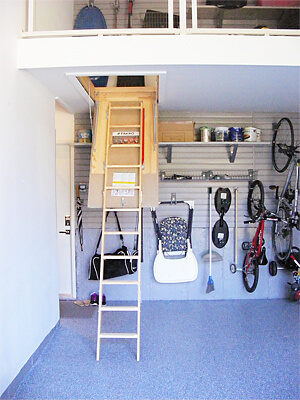 Because the garage had a very high ceiling, I was able to design and install an overhead storage platform. For additional safety and a clean, sleek look, it has an aluminum and tempered glass railing. Since the platform will be used as a storage area for items that only need to be accessed seasonally, I installed a retractable attic ladder that can be tucked onto the platform when not in use and won’t take up valuable real estate. The wall storage was maximized on the passenger side of the car and rear walls to allow for an easy exit from the car on the driver’s side and unimpeded entry into the home. To accommodate all the sports equipment and automotive products, a five-foot band of slatwall was installed on the right and rear walls including the entry alcove into the house. Using a combination of lockable hooks, shelves and baskets, everything was given its own spot according to use. 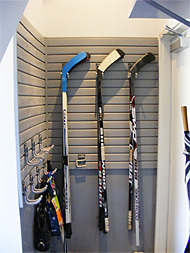 Additionally, the entry alcove has now become the idea spot for kids’ coats, backpacks, anything the nanny might need and dad’s hockey sticks. To camouflage the unsightly electrical box, a customized cover was created to blend with the slatwall system. It allows for easy access to the electrical panel when needed while also utilizing the space for additional storage. The floor was painted with polyasparticcoating, which reduces dust and is very easy to clean and maintain. It consists of three layers. A base coat, flake coat and sealing coat. For this garage transformation, a customized colour mix with a hint of sparkling glitter gives it an even brighter quality and combined with a 4 x 4 fluorescent fixture with T8 lights makes the space airy and evenly lit while using minimal electricity.